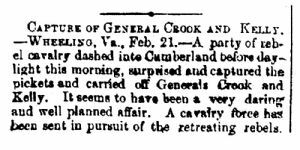 A party of rebel cavalry dashed into Cumberland before day light this morning, surprised and captured the pickets and carried off Generals Crook and Kelly. It seems to have been a very daring and well planned affair. A cavalry force has been sent in pursuit of the retreating rebels.